Backstage magazine's 2012 Fall College Guide listed Augsburg College among the top five U.S. institutions for theater majors who wish to continue their studies professionally. "In our Theater Department, students connect with professional artists in the city while they delve into their theater courses," said Darcey Engen, Augsburg College associate professor and chair of Theater Arts. "We find that the combination of the department's rigorous curriculum, exposure to outstanding professionals in the field, and mentorship with theater faculty prepare our students to graduate as complex, deeply committed artists who can apply their insights and skills to any occupation." In the article "On the Boards & Chalkboards" —released October 25, 2012—Backstage recommended an Augsburg education for "enterprising, driven students looking to climb the [professional] ladder in double time." The article described the three academic concentrations the College offers theater majors, highlighted Augsburg's course offerings, and emphasized the theater program's proximity to the renowned, Minneapolis-based Guthrie Theater. "Augsburg gives students the chance to listen to arts professionals ranging from stage managers to casting directors" who speak at the College's Theatre Artist Series, according to the article. Augsburg students also have the chance to intern at the Guthrie Theater, and "most of the Guthrie's casting is done locally, so students already have a leg up." See the Backstage magazine slideshow that lists Augsburg under the 5 Top College Theater Programs Outside of NY. Backstage serves actors, singers, and dancers by connecting them to the greater performing arts community, and has existed as a theater industry publication for more than 50 years. 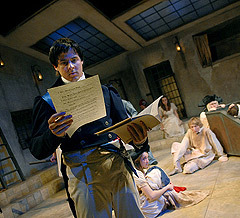 This story was also published on the Augsburg College Theater Department web page, http://www.augsburg.edu/theater/distinctions/.